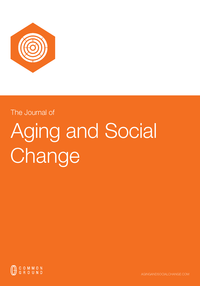 The Journal of Aging and Social Change is an international journal for aging research. It features articles on the dynamic interplay between aging and society, exploring advances in social and behavioral science on aging, life-course and social change, involving (but not limited to) gerontology, sociology, demography, psychology, economics, communication science, education, epidemiology, public health, biology, nursing and medicine. The Journal of Aging and Social Change is devoted to multi- and interdisciplinary research that centers around social and behavioral science as well as to disciplinary approaches that are compatible and advantageous beyond merely discipline-specific discourses. Articles published in The Journal of Aging and Social Change focus on theoretical, conceptual and/or methodological advances, on the growth of empirical knowledge about age and aging in an increasingly diverse and changing global society, as well as on the impact and relevance of knowledge about aging for policies and the global society. Besides original empirical research articles, The Journal of Aging and Social Change includes brief research reports, articles that focus on theoretical and methodological advances, and review articles on cutting-edge topics. All submissions are peer-reviewed, supported by rigorous processes of criterion-referenced article ranking and qualitative commentary, to ensure the substance and significance of the published works. The Journal of Aging and Social Change currently has a 30% acceptance rate, based on 2017 statistics. Review scores are based on a clearly articulated rubric, and the result is a peer-review process that is scrupulously fair in its assessments, while at the same time offering carefully structured and constructive feedback that enhances the quality of the published article. Each year a top ranked article from The Journal of Aging and Social Change receives the International Award for Excellence. We are committed to expanding the visibility, reach, and impact of research from the Aging and Social Change Research Network. Journals in The Journal of Aging and Social Change can be found in numerous databases, accessible via the libraries of institutional subscribers, and in the CG Scholar Bookstore for current Research Network Members.